So far as I have been able to discern the chassis numbers for the production Ford GT40 Mk1 ran from P/1000 to P/1086, suggesting at least 87 production GT40 Mk1’s were built at Ford Advanced Vehicle facility in Slough, though as we shall see things are not always quite so simple. Today’s featured car is a case in point, known as #P/1084 it has the highest chassis number of those known to have raced in period, though chassis P/1071 did not make it’s race debut until 14 month’s after #P/1084 appeared at Spa in May 1968 with Paul Hawkins and David Hobbs at the wheel. However it turns out that #P/1084 started life as #P/1004 in 1965, a car that was entered into the 1965 Le Mans 24 hours by RRC Walker Racing and Shelby American for Bob Bondurant and Umberto Maglioli, this car running the #7 qualified third but retired with a leaking head gasket on lap 29, coincidentally the same lap as it’s sister #P/1005 driven by Ronnie Buckum and Herbert Müller retired with the same problem. #GT40 P/1004 then appears to have gone on Carrol Shelby’s promotional tour of America known as the Cobra Caravan. 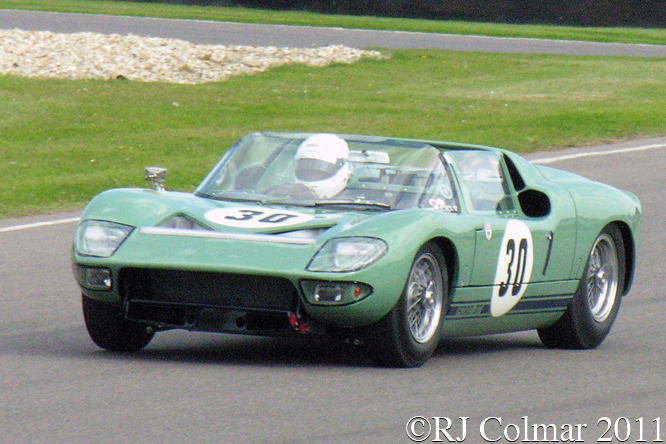 When the JW Automotive Gulf team, operating from the same factory as Ford Advanced Vehicles had in Slough, needed a car for the 1968 Spa 1000kms they found they were a car short and so they rebuilt #P/1004 to 1968 specification and gave it a ‘new’ GT40 P/1084 identification although the factory records refer to the chassis entered at Spa where Hawkins and Hobbs finished 4th by it’s old number. 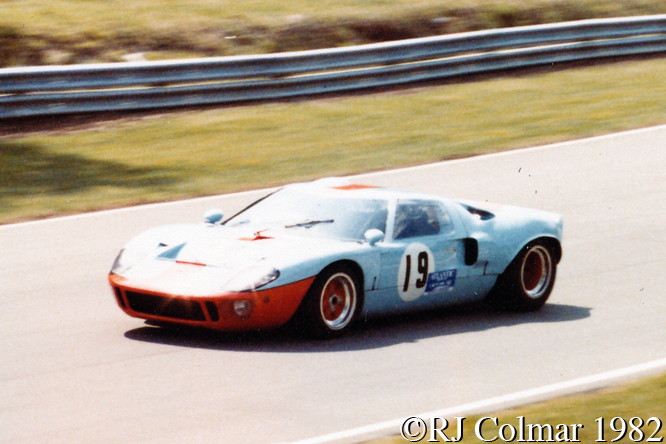 Some sources believe that #P/1084 was then shipped, by JW Automotive, to Watkins Glen two month’s later where Hawkins and Hobbs finished 2nd however I believe this is a typo, GT40 über authority Ronnie Spain identifies the car that Hawkins and Hobbs drove at Watkins Glen as GT40 P/1074. 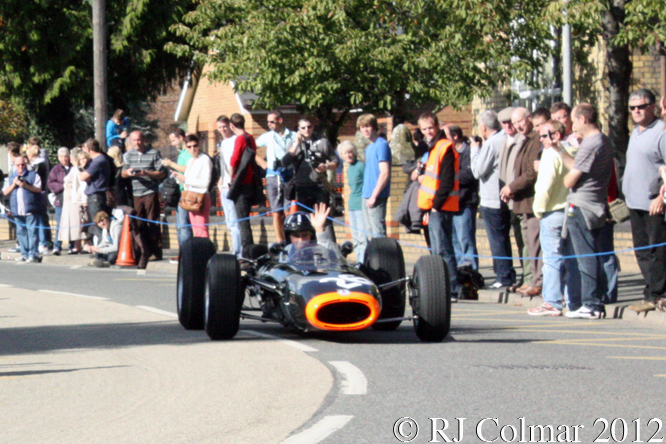 During the 1970’s P/1084 was raced by Paul Wheldon for owner Connaught Engineering founder Rodney Clarke. Martin Colville seen in the #P/1084 here at Brands Hatch in July 1982 where Martin was taking part in a support race on the British Grand Prix weekend bought the car in 1981 and had a bubble fitted to the upper part of the drivers door to accommodated his frame. Subject to revisions in Ronnie Spain’s much anticipated second edition bible on the subject “GT40: An Individual History and Race Record” this is my best understanding of the car known as #GT40 P/1084. 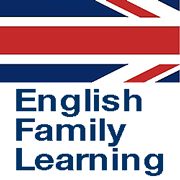 If you know different please do not hesitate to chip in below. My thanks to David McKinney, Pete Taylor and Ron54 at The Nostalgia Forum for their help in yet another carceology adventure. 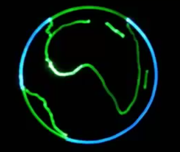 Thanks for joining me on this “Cobra Caravan Itinerant” edition of “Gettin’ a li’l psycho on tyres” I hope you will join me again for Ferrari Friday tomorrow. Don’t forget to come back now ! This entry was posted in Uncategorized and tagged Bondurant, Brands Hatch, British Grand Prix, Car, Clarke, Cobra Caravan, Colmar, Colville, Connaught, Ford, Ford Advanced Vehicles, GALPOT, GT40, Gulf, Hawkins, Hobbs, JW Automotive, Magioli, Mk 1, Racing, Ralph, Shelby, Spain, Sports, Walker, Wheldon on December 19, 2013 by Ralph. In 1965 Ford’s open check book approach to winning the Le Mans 24 hours was in full swing when today’s car, first appeared in public at the Le Mans Test weekend where it was driven by John Whitmore and Richard Attwood to a 6th fastest time. In all four steel chassis Ford GT Prototype Roadsters were built, #GT/108 and #GT/109 were sent straight from Ford Advanced Vehicles in Slough, England to Carrol Shelby for testing #GT/108 never raced and #GT/109 made a single race appearance, entered by Ford France at Le Mans in 1965 where Maurice Trintignant and Guy Ligier retired with gearbox problems. 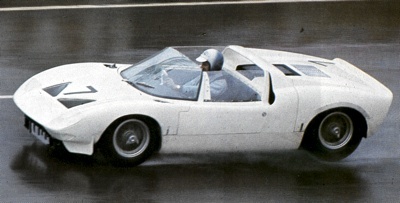 Additionally a fifth roadster was built with an aluminium chassis #GT110 this car was developed by Bruce McLaren and Howden Ganely and is known as the GT X1 which was further differentiated from it’s siblings by the use of a Ford Galaxie derived 7 litre / 427 cui motor and a Hewland gearbox all of which resulted in a car 1000 lbs lighter than the original Ford GT Prototypes. #GT/111 and #GT112 were the last of 12 Ford GT prototypes to be built in Slough and the pair took part in just three races entered by Ford Advanced Vehicles run by John Wyer. Wyer had been team manager at Aston Martin when Roy Salvadori and Carrol Shelby drove the Aston Martin DBR1 to victory in Le Mans in 1959. Carrol Shelby now running his own race shop and contracted to enter some of Ford’s GT cars persuaded Ford to run the heavier more powerful iron block 4.7 litre 289 cui V8 from the Cobra racing programme in place of the original GT Spec 4.2 litre / 256 cui Windsor derived motor, apart from X1 all the GT Roadsters appear to have been fitted with Shelby’s Cobra 289 cui V8’s. #GT/111 was painted white and fitted with wire wheels for it’s first public appearance was at Le Mans, a month later #GT/111 was painted a curious shade of Green, a gesture to the chassis and entrants British heritage, it was also fitted with Shelby magnesium wheels for the Targa Florio. John, now Sir John, Whitmore and Bob Bondurant were chosen as Ford’s sole representatives in #GT111 which was to compete against three works Ferrari 275P/2’s fitted with the latest 3.3 litre / 201 cui 4 cam V12 motors. A couple of months ago I went to a talk by Sir John organised by the Club Lotus Avon, in which he related how he was speeding along when the left front wheel came adrift forcing him to stop, Sir John replaced the wheel with the mandatory spare and secured it with the original hub nut which had been returned to him by a policeman and continued on his way, contemporary reports tell how the loose wheel took down some overhead railway power lines ! On lap 8 of the 10 lap race, each lap being run over a 44 mile 72 km closed (narrow) road circuit, Bob Bondurant crashed after sliding on gravel into a wall and then bouncing into a water trough which tore off a front wheel and it’s suspension. The 1965 Targa Florio was won in 7 hours and 1 min by local hero Nino Vacarrela and Lorenzo Bandini driving a Ferrari 275P/2. The damage to #GT/111 was never repaired and a similarly painted #GT112 appeared in it’s only works entered appearance for the 1000 km race at the Nurburgring driven by Attwood and Whitmore who retired with an engine mounting failure having started from 6th on the grid. Of all the GT Roadsters the aluminium light weight #GT110 X1 had the longest works supported career having been entered in 4 races by Bruce McLaren for Chris Amon in 1965 who scored a best 5th place finish in the 200 mile race at Riverside. The following season X1 appeared with original GT Roadster type bodywork in the Sebring 12 hours entered by Shelby American for Ken Miles and Lloyd Ruby who won the race from 5th on the grid. X1 was subsequently ordered destroyed by customs officials. At he end of 1965 Ford moved it’s entire GT racing developemnt programme out of Ford Advanced Vehicles in Slough to Shelby and Kar Kraft in the United States, #GT/112 was sold to Peter Sutcliffe who raced the car in 1966 and scored a couple of season high second place finishes one in South Africa and the other in France during the 1967 season. 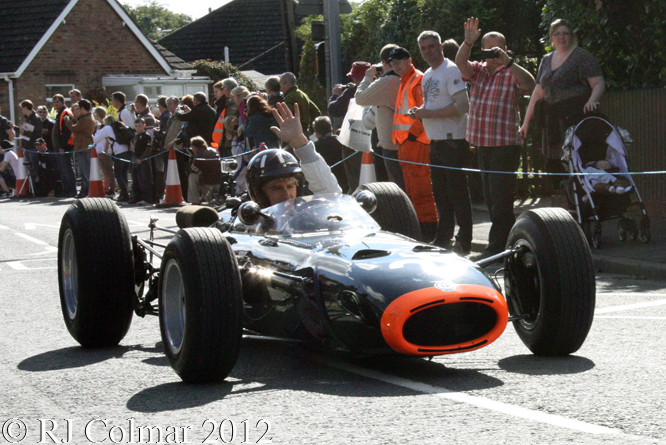 For 1968 Bob Vincent acquired the car and appears to have won second time out in an open class race run at Aintree. The damaged #GT/111 was scheduled to be scrapped, however the scrap yard saved the chassis which was acquired by the present owner, in 2006, after Ford GT expert Ronnie Spain verified #GT/111’s identity. 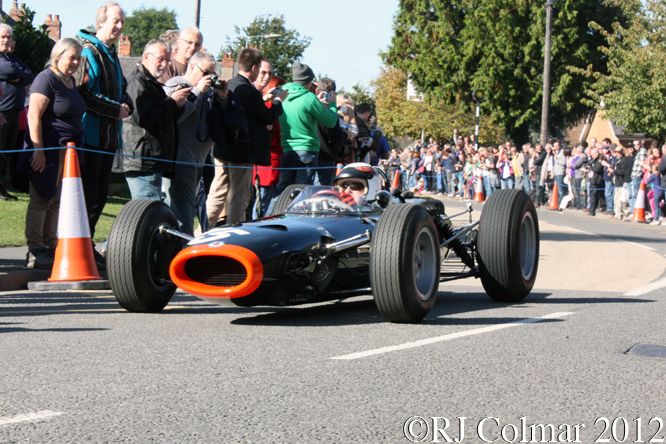 The car seen in this photo driven by Andrew Newall at the Goodwood revival a couple of years ago, has been restored by Glescoe Motorsport and is to appear at RM auctions in May 2014. Thanks for joining me on this “Three Wheels On My Wagon” edition of “Gettin’ a li’l psycho on tyres”, I hope you will join me again for Ferrari Friday tomorrow. Don’t forget to come back now ! This entry was posted in Uncategorized and tagged Advanced, Attwood, Bondurant, Colmar, Ford, GALPOT, Goodwood Revival, GT, Le Mans, Newall, Prototype, Ralph, Roadster, Shelby, Slough, Spain, Targa Florio, Vehicles, Whitmore, Wyer on December 5, 2013 by Ralph. There are some ideas that have to wait until just the right time in order to have an impact, one such case in point is the idea of using a monocoque shell to build a racing car chassis / body rather than the oft used couple of helfty rails or beams welded together or a more intricate space frame built up of small tubes welded together with a body thrown over the top. 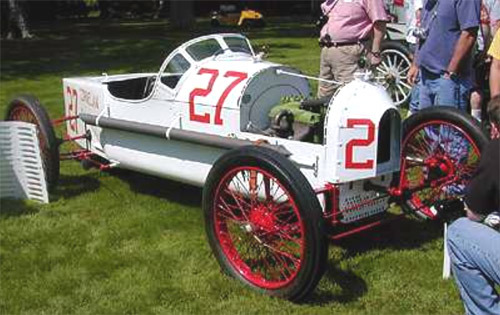 The idea of using a monocoque shell made of fabricated sheets of metal to build a racing car can be traced back to 1912 when Howard Blood built a prototype cyclecar called a Cornelian which in 1915 was prepared by the Chevrolet brothers Louis and Albert for an attempt at the Indy 500. The Cornelian reached 12th place before it’s 33hp Sterling motor dropped a valve causing retirement. Around 100 monocoque chassis Cornelian cyclecars are thought to have been built before production came to a halt. In 1923 aviation pioneer Gabriel Voisin built a team of four extraordinarily underpowered monocoque racing cars to take part in the French Grand Prix at Tours, giving away over 15 mph in top speed just one car survived to finish fifth and last over 1 and a quarter hours behind the winner over the 496 mile race distance. 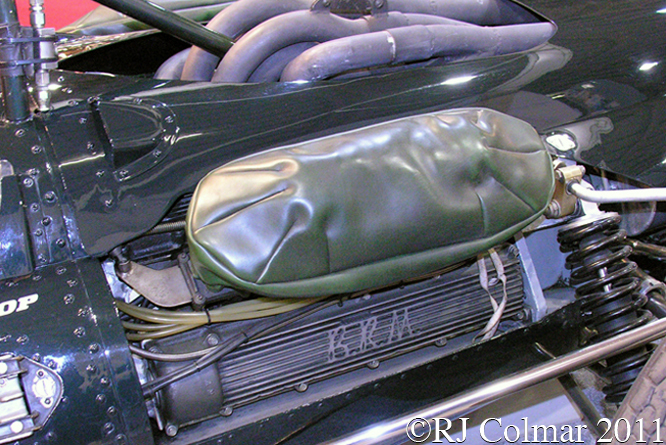 Despite the success of the D-Type Jaguars at Le Mans in the mid 1950’s which featured a half monocoque design with the engine mounted on a sub frame it was not until 1962 that Colin Chapman revisited the monocoque idea for use in a Grand Prix Car and started to make the advantages of structural rigidity, thanks to the use of innovative steel bulkheads, weight saving and reduced frontal area work in the Lotus 25 design which shares identical suspension and running gear with the 1962 space frame Lotus 24. 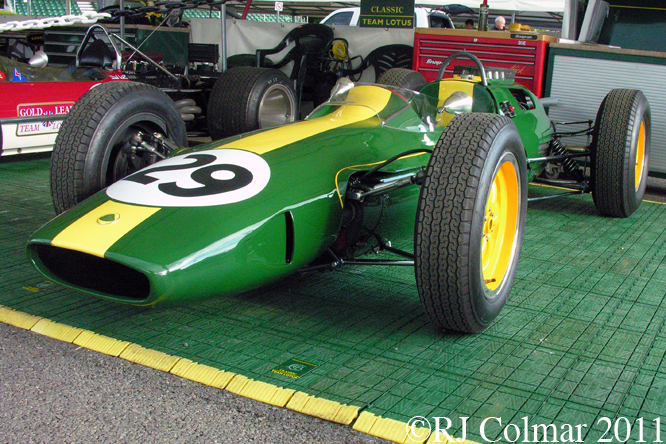 The Lotus 25 chassis #R5 was one of seven such vehicles used for Grand Prix Racing from 1962 until models eventual swansong in 1967. 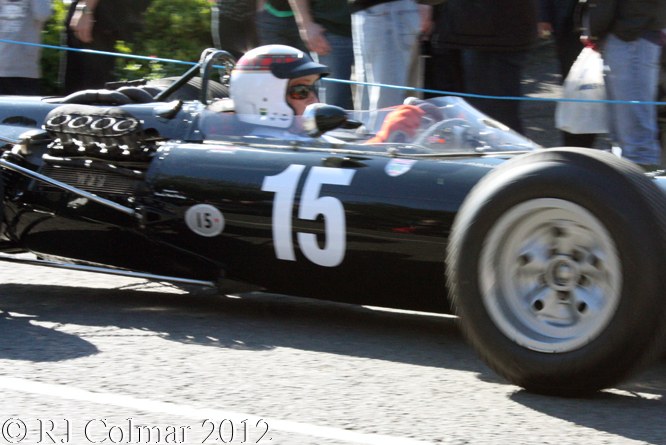 The #R5 chassis was completed late in 1962 just in time for Jim Clark to attempt to clinch his first World Drivers title at the South African Grand Prix, unfortunately after starting from pole a tuppenny oil plug came lose and ended Jim’s race twenty laps early allowing Graham Hill to win both the race and the World Championship. Jim used the car again in 1963 but Trevor Taylor was given #R5 to race at the second event of the season Belgian Grand Prix at Spa Francochamps. During practice for this event #R5’s suspension collapsed and the subsequent damage meant Trevor continued participating in the spare car #R3. Thanks to Roger, Rob of The Nostalgia Forum it has emerged that Trevor retired from the 1963 Belgian GP after 5 laps as the result of a severed thigh muscle. Chassis #R5 was taken back to the Team Lotus Factory and stripped down to the bear monocoque which was put aside awaiting recycling when Lotus mechanic Cedric Selzer was given permission to take the wrecked monocoque, along with some redundant parts, home. Over the next twenty years Cedric collected enough parts including a correct Coventry Climax V8 engine to ‘recreate’ the written off #R5 in 1984. With the full knowledge of the story of #R5 being in the public domain this rare vehicle sold for just short of a million US$ at auction in 2007. 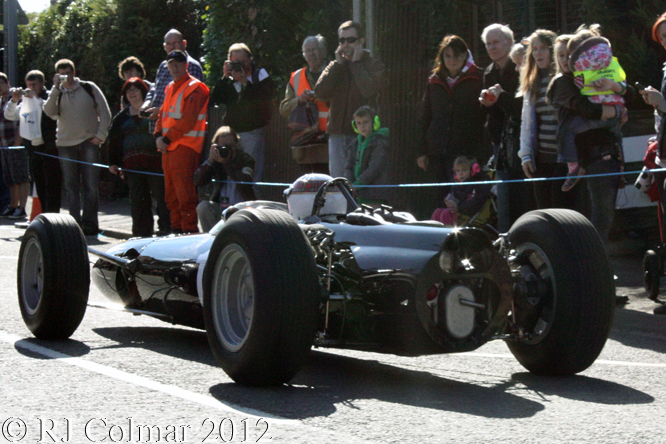 This second Lotus 25, chassis #R4 seen above with Andy Middlehurst at the wheel during the Goodwood Revival meeting has an even more amazing tail to tell, it is the remains of the very car which Jim Clark drove to a, for the period, record setting seven Grand Prix victories on his way to securing the 1963 World Drivers Championship and the World Manufacturers Championship for Lotus. 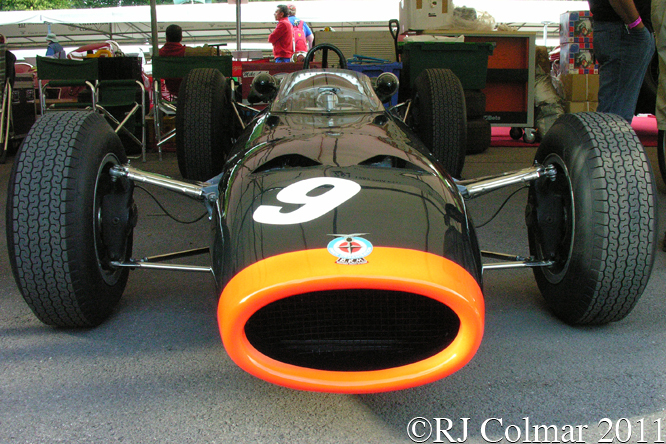 In 1964 #R4 was driven by Formula Junior sensation Peter Arundell who started his first full season in Grand Prix racing with two third place finishes in the opening two races at Monaco and Zandvoort (Holland) and came home 4th in the French Grand Prix which proved to be his last of the 1964 season thanks to an accident in an open wheel Formula 2 race which effectively ended Peter’s career although he did unsuccessfully return to the wheel in 1965. 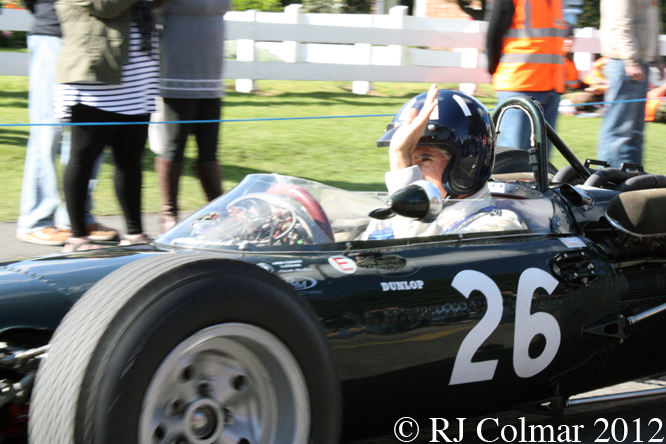 #R4 was then sold to Reg Parnell who replaced the Coventry Climax V8 with a BRM V8 and then given first to South African Tony Maggs and then Richard Atwood to drive. Richard crashed the car in the Belgian Grand Prix after which the repaired chassis was given the #R13 chassis number by the Parnnel Team in what might be considered a slight of hand to make the car look like it had a later Lotus 33 type chassis number, the #R13 chasssis number having been passed over by Team Lotus. #R13 also acquired the nickname Percy at this time. Innes Ireland and Bob Bondurant competed in one further race each with ‘Percy’ towards the end of 1965 and in 1966 Mike Spence took over the driving duties scoring 2 season best 5th place finishes in Percy which was now fitted with a larger BRM P60 V8 motor. 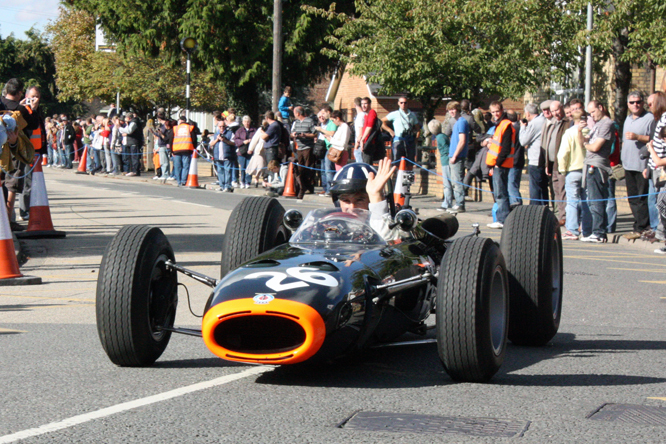 Piers Courage and Chris Irwin both took a championship Grand Prix start each in Percy during 1967 Chris recording a 7th place finish in the cars final Grand Prix in Holland. Peter Yock became the owner of #R13 in 1968 and he raced the car in the Antipodes passing it on to fellow Kiwi Peter Hughes for 1970, Hughes replaced the by now damaged BRM V8 with a dry sumped V8 sourced from a Daimler and when that proved recalcitrant had a Twin Cam 4 cylinder Ford motor fitted. #R13 then disappeared until Lotus aficionado John Dawson Damer tracked it down for his Lotus Collection in Australia, when John had the car restored it was discovered that #R13 was not a similar later Lotus 33 spec monocoque at all but that it still had all the identifying monocoque features associated with the Lotus 25 and in particular chassis #R4. Like Cedric John also acquired the correct Coventry Climax V8 type motor to restore #R4 to it’s original splendor and in 1997 #R4 returned to Gooodwood for the first time. Again with all of the details of this car in the public domain this car sold at an Australian Auction for just short of a million US$ in 2008. 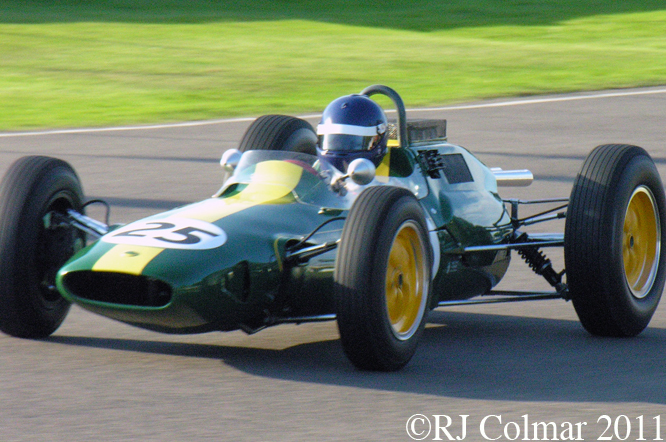 It’s a sobering thought that Jim Clark was entered to drive a Lotus 25 in 30 championship Grand Prix races, he won 14 of them, won one world championship (1963) and but for some cheap engine parts might have won two more (1962 & ’64). One thing was for sure, after the advent of the Lotus 25 the writing on the wall was written large that the days of the space frame racing car particularly in open wheel racing was effectively over. Finally a well known resource states that Lotus driver Trevor Taylor is credited with ‘inventing’ the yellow stripe that ran the length of some Team Lotus racing cars from May 1963 until the Lotus sponsorship deal with Players Gold Leaf Tobacco came into effect in 1968. 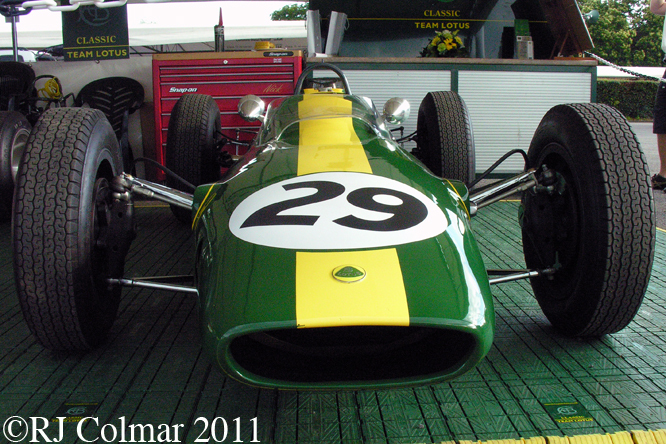 There is to the best of my knowledge no evidence to support this myth, it would appear the yellow stripe was first used on Jim Clark’s #92 Lotus 29 Indy Car in May 1963 and next appeared on his, and only his, Lotus 25 at the British Grand Prix in July 1963. My thanks to Barry, Davids McKinie and Lawson, Vicuna, Roger and Rob at The Nostalgia Forum for their help dispelling the Trevor Taylor myth. Thanks for joining me on this Monocoque Revolution edition of ‘Gettin’ a li’l psycho on tyres’, I hope you will join me again tomorrow. Don’t forget to come back now ! 14/01/12 Amendment it has come to light thanks to Roger Clark that Trevor Taylor had his mishap with #R5 during practice for the Belgian GP at Spa not during the race as originally stated in the text above. 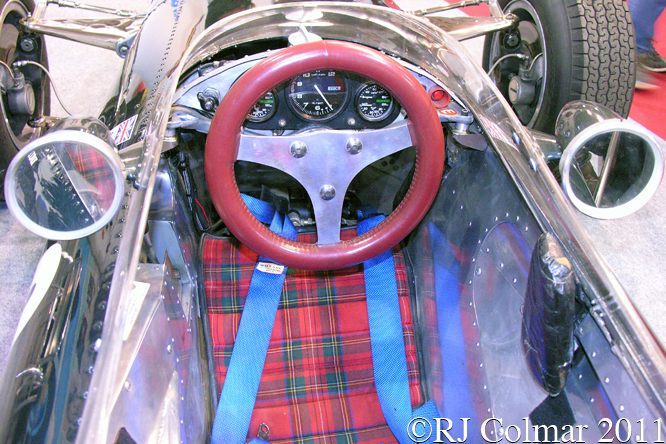 This entry was posted in Uncategorized and tagged 25, Atwood, Bondurant, Chapman, Clark, Climax, Colin, Colmar, Courage, Coventry, GALPOT, Goodwood, Ireland, Irwin, Lotus, Maggs, Ralph, Selzer, Spence, Taylor on January 14, 2012 by Ralph.